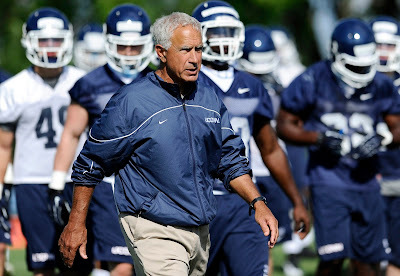 When UConn football coach Paul Pasqualoni spoke at the August meeting of the Middlesex Chamber of Commerce on Tuesday morning, he admitted that the identity of his third UConn squad is still yet to be determined. He did, however, make sure to pat some of his players on the back for the way they have come back from offseason surgeries. "Every year’s time is unique and it is different," Pasqualoni said. "We are trying to find out what our identity is because it is a completely new year, a completely new season. I am not sure what our identity is right now. We are not going to find out what our identity is until we get into that stadium, we have another team in there who comes across the line of scrimmage and hits us right in the face and we will see how we react to that. I like what I see so far. I think we have to determine who are the guys. "We have 10 guys since last season who had to go through some sort of surgery and not just kind of casual kind of surgery but (serious) surgery. That is a lot of guys who were out from last winter, through the spring, were cleared in June and are practicing now. Shamar Stephen, who is going to be outstanding, Jesse Joseph, who was granted another year of eligibility coming back from his Achilles, Graham Stewart has major surgery on his pectoral muscle, E.J. Norris has a shoulder (surgery), Chad Christen had a big operation on his groin and he is doing really well. He stayed in Storrs every day this summer, went to rehab and training every single day. The guy didn’t have a summer, he had no summer and that is (a sign) of the determination he’s got. (Martin) Hyppolite, he was in that car accident and broke his hip. He hasn’t missed a snap in preseason. Jon Hicks coming back from major knee surgery has done it and is practicing in 4½ months and I have never seen it done at any level of football, that is how hard he is working. He had no summer; he was with Bob Howard and our training staff every single day, Omaine Stephens another shoulder. These guys have got a strong, strong inner will." For those scoring at home, he mentioned eight of the 10 and he would later mention Jimmy Bennett as well." Pasqualoni told the story of a coach who had a player who expressed a desire to become a great player and took him to the beach. The coach and player walked out to the water until it was up to their necks and then pushed the player's head under the water and held it there for an extended period of time. When he allowed the player to get his head above water he asked him what he was thinking about and the player said "breathing." Then he stated that to be a great player that you have to want to succeed about as much as you long to breathe. He said he sees that level of passion among some members of the 2013 squad. "The core of the guys we have, I get that feeling with some of these guys that is now hard we are working," Pasqualoni said. "We are awfully proud of them. Ten of them are going to be ready to go next Thursday against Towson." Pasqualoni had some fun during his 18-minute speech. After being introduced he said :"I am happy to be here and honestly I am happy to be anywhere after two 5-7 seasons." The biggest roar he got from the packed room came when he mentioned the importance of coaches' wives at this time of the year when their husbands aren't around a heck of a lot. "Your wife is your best friend," Pasqualoni said. "One of the coaches says to me ‘your wife is not your best friend, the dog is your best friend.’. I said 'I promise you, your wife is your best friend’. He said ‘Coach, try this, lock the dog and your wife in the garage. Come back three hours later and see which one is happy to see you.’"
He also told the story of a recent call from former linebacker Sio Moore, who has been known to be a tad bit exuberant regarding most things especially football. "Sio called me the other day and said ‘Coach, guys have gotten hurt and I am in the starting position and I am doing everything I can possibly do to be a starter as a rookie with the Oakland Raiders,’" Pasqualoni said. "Sio can get a little carried away with all that Raider garb on and I said just don’t be painting your face like those nuts in the end zone." UConn is slated to scrimmage this afternoon and there is an outside chance that the two-deep chart for the Towson game could be finalized tomorrow. However, with camp not breaking until Friday, it is more likely that UConn will not release its depth chart until we get closer Aug. 29 when the Huskies open the season against Towson.